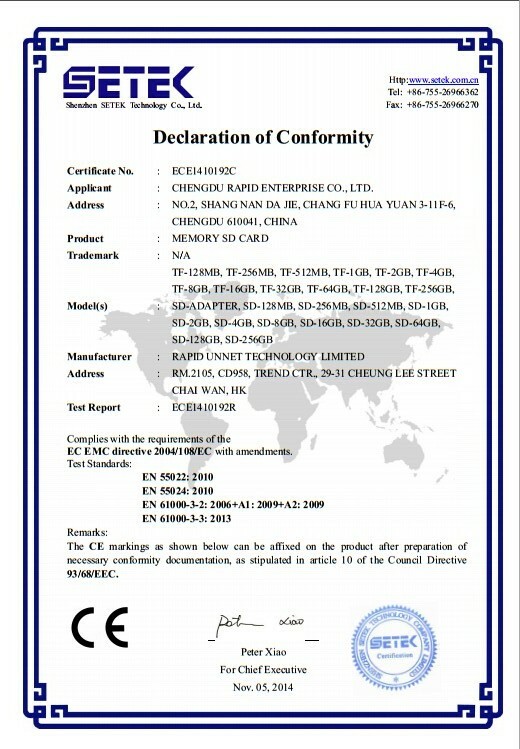 Company Overview - Chengdu Rapid Enterprise Co., Ltd.
10YRSChengdu Rapid Enterprise Co., Ltd.
Make your work easy, Make your family Life more happy. We hope to win with you together. 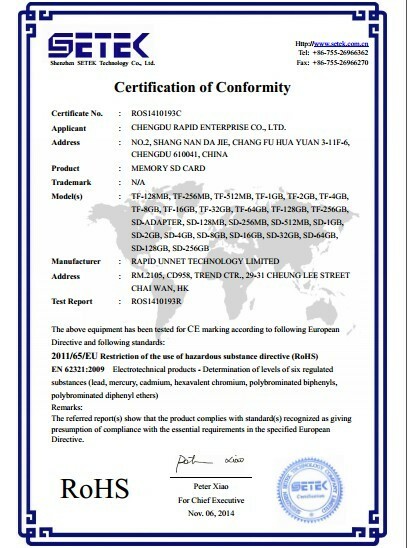 M/S Chengdu Rapid Enterprise Co., Ltd. , is a comprehensive and very serious corporation with registered address located in Chengdu, where is the biggest center city of economic and culture of west China. Major Events:- experience of export business since 1992, - changed company name and established in 2004, - investment for Shandong Bearing Factory in 2006- joined alibaba Gold Memeber in middle 2009 as a Trading Company.- investment for Chongqing Plastic Product Factory in 2010- investment for Shenzhen Electronic Technical Factory in 2012- joined alibaba Trade Assuranced Memebership in 2014 Through our excellent Team's many years' hard working perseverely, Rapid Enterprise has gradually developed into a strong comprehensive company full of vigour. Our Main Electronic Comsumer Products:- Memery sd Cards, adapter and package- USB 2.0 and 3.0 Flash Drives, pendrive/ sticks- Vehicle / Car electronic products such as Navigation, MP3, charger...- Communication and Mobile Phone Accessories, such as Power Bank, Battery, earphone, headset, charger, self timer...- Computer Accessories, - Printer and Accessories, - other various new and fresh designs products.... Main traditional Products:- Ball and Roller Bearing, plastic coated ball bearings- Plastic products...- Office and Home Furnitures Our Motto: - Buyers pay money NOT buy troubles. - Everyone gains money NOT easy, we must promise buyers money safe.- Every body maybe face this or that troubles, difficulties during his long life time, but all these things can not change us to be a serious and honest person anytime. - Rapid Enterprise's products must be worthy for our customers' payment. Our Objective: 1, Keep improving our customers Transparent and Secure Purchasing Experience. 2, Different area people are not same rich, different customers has different quality and target price requirements, as a manufacture and cost solution expert, we hope to supply Fulfilling the needs of various customers including OEM & ODM service. 3, Welcome all customers send us any improving suggestions and make friends with us,and we will return you better service along with best price and quality. Part of Our Work Style Key words:Transparent, serious, honest, safe, direct talking, best service, fast response and fast delivery, never cheat. Shenzhen Branch - Electronic products FactoryChongqing Branch - Plastic Bottle and Nasal Inhaler Sticks Factory;Shandong Branch - Ball and Roller Bearings Factory;Chengdu: Head Company location deal with various products. all above Factories with ISO certificate and relative necessary Certificates. By virtue of perseverance and tendering quality products to the customers, we have been able to increase our domestic and abroad customers Quanity and Quality, depend on not only our good & steady quality, our competitive & affordable price, short delivery, but also our honest & reputation, our obliging & good service. Rapid Enterprise are committed to provide all kinds of high quality solutions and always strives to create long term relationship with all our potential customers. In Rapid Enterprise Team, the customer's need is always the priority. Whether the order is small or big, Rapid Enterprise deals with it with equal seriousness, enthusiasm, concentration, dedication and priority. Please feel free to contact us, and send us your inquiries. We will do your left works as One-Team for you and you will have a new and wonderful option.